Limited Spaces Available! For reservations call (877) 885-5397. Spaces are extremely limited this time of year so book early to ensure the date you want. Our split charters are offered on the light tackle boat fleet. For $375, you and your group will be taken out for a day of fishing. The $375 covers you and another person. The small charter guarantees for a comfortable and individualized time, so you don’t have to worry about overcrowding. Since we hate to have overcrowding on our charters, this means more chance to catch delicious fish, and less fishing lines to get tangled. And because our boats have twin outboard motors, you will travel the waters at a faster rate, and have more time actually fishing the spots. All of our boats come with a fully equipped private bath. 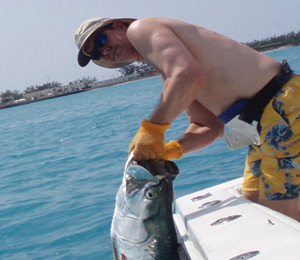 Come experience the best fishing in Key West, and you won’t regret it. What is a split charter? A split charter is where a 4 passenger deep sea fishing boat is broken down cost wise by the pair, we guarantee that you fish weather we can pair you up or not. If the activity is cancelled due to bad weather, and you cannot reschedule, you will be issued a full refund. 1/2 Day Trips = 4 Hours 3/4 Day Trips = 6 Hours Full Day Trips = 8 Hours. No they are not, however you are more than welcome to bring your favorite foods and beverages and we will provide a cooler and ice to keep them fresh and cold for you. Key West Top Guides is always interested in your tour experience with us. We hope you enjoyed your tour and love to hear comments. I have been to the Bahamas many times, but Key West Fishing Split Charter is one of my favorite trips! It includes everything that everyone should do here. As a Bahamas veteran, I can say only the best about this experience!